Sit comfortably and easily take care of your garden. 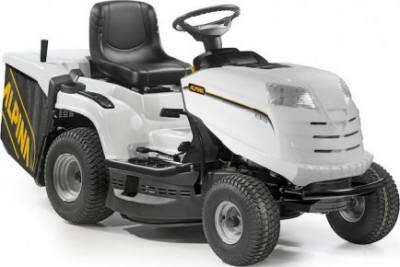 Suitable for areas up to around one acre, the Alpina AT5 84 HCB is a sturdy, collecting tractor lawnmower powered by a dependable Briggs and Stratton 344cc engine. The AT584HCB features a 84 cm / 33 inch double blade cutting deck with 7 cutting heights and a cutting height range of 25mm to 80mm. This ride on has an electromagnemtic blade engagement that allows the blades to be turned on or off by the push of a button. Its compact size fits any garden gate under 36 inches wide. 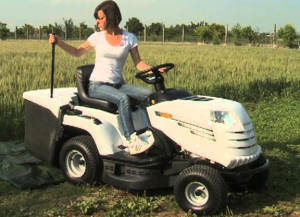 The Aplina AT584 HCB come fitted with a pedal driven hydrostatic transmission that allows for effortlessly speeding up or slowing down, giving the user complete control over the mower. This tractor lawnmower comes fitted with ergonomic steering wheel, high back support seat, 240 L grass collector, front headlights to allow night work and rubber foot panel cover. 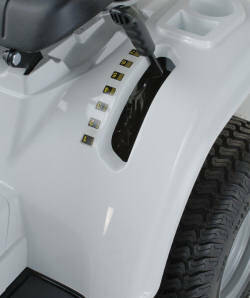 It includes the battery charger and the strong front bumper. Mulching kit and trailer hitch available as optional accessories. Suitable for gates of 36"